Today (Feb. 22), Shana Cleveland shares the video for “Don’t Let Me Sleep,” the spaced-out second single from her forthcoming record Night of the Worm Moon, exclusively at Paste. This latest track slows down slightly in comparison to the previously released “Face of the Sun,” spinning a dreamy, psych-folk lullaby meant for a night spent UFO-spotting. 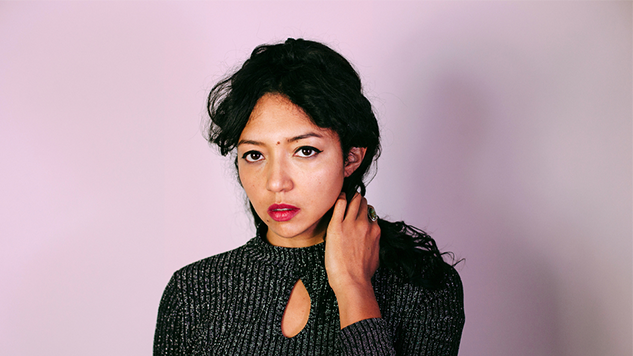 Cleveland first came up through the Seattle scene as the frontwoman of surf-rock quartet La Luz. This isn’t her first solo project, but so far, it feels like her most daring. She concocted Night of the Worm Moon while living in Los Angeles, a far cry from the perennially drenched Pacific Northwest. The new record draws inspiration from her Golden State home, as well as a vast range of ideas, from alternate realities to Afrofuturism. Now, Cleveland has retreated to rural California, which serves as the setting for the “Don’t Let Me Sleep” video, directed by past La Luz collaborator Ryan Brown. The singer, clad in a shimmering outfit, grooves through an otherworldly kaleidoscope of colors and textures. It’s nearly three-and-a-half minutes of an extraterrestrial drug trip, from the pulsating globs of silver cupped in the musician’s hand to the glistening pile of worms wriggling in the dirt. For “Don’t Let Me Sleep” the idea was to make the sort of low-budget sci-fi video that an alien-obsessed California cult might dream up. I recently moved to a little house down a dirt road in the Gold Country of Northern California and after living in cities for all of my adult life, being so deep in the country often gives me the sense that I’ve been dropped on another planet. Ryan Brown, who I’ve worked with before on a couple La Luz videos, came up and filmed this with me in my backyard. Watch the video for “Don’t Let Me Sleep” below, along with Cleveland’s tour dates, and explore the details of Night of the Worm Moon, out April 5 via Hardly Art Records, here.